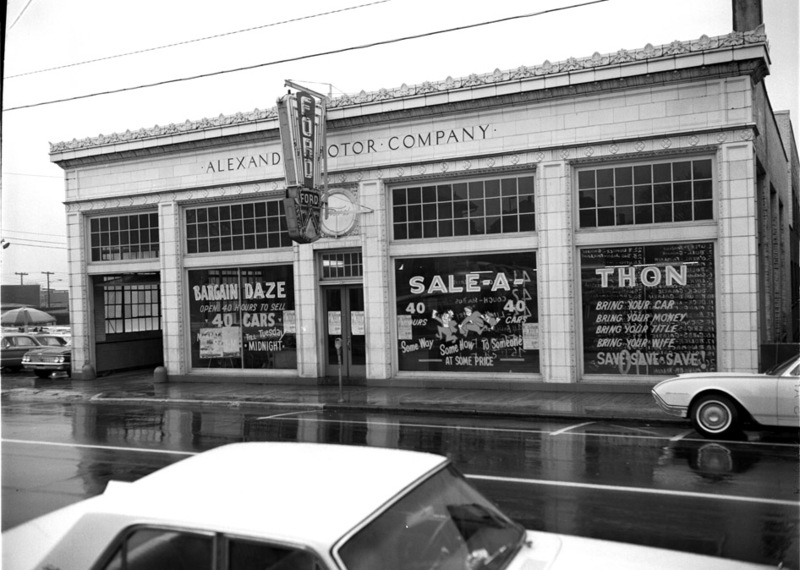 The Alexander Motor Company was established in 1916 by S. Parks Alexander on the corner of Church and East Parrish Sts. In 1924, they constructed their new dealership at 330 East Main St. To get a sense of how things have changed in the world of car dealerships, the Alexander Ford Company hired Milburn and Heister to design their structure. The building looked better with the Ford sign hanging in front, where I once bought a 1966 Mustang. During the early 20th century, the large, elaborate dwellings in the 300 and 400 blocks of East Main St. (the two blocks between Roxboro and Dillard St.) were progressively torn down to make way for commercial and institutional structures. A frame, single story house sat on the site of the later Alexander Motor Company from the 1880s until the 1920s. The Alexander Motor Company was established in 1916 by S. Parks Alexander on the corner of Church and East Parrish Sts. The company started out by selling the Model T Ford. In 1918, the company moved to Foster Street, between East Chapel Hill and Morgan Streets. In 1921, they built a three-story sales and service building "north of the 200 block of East Chapel Hill St., about midway between Foster and Roney Streets." (Whatever that means.) 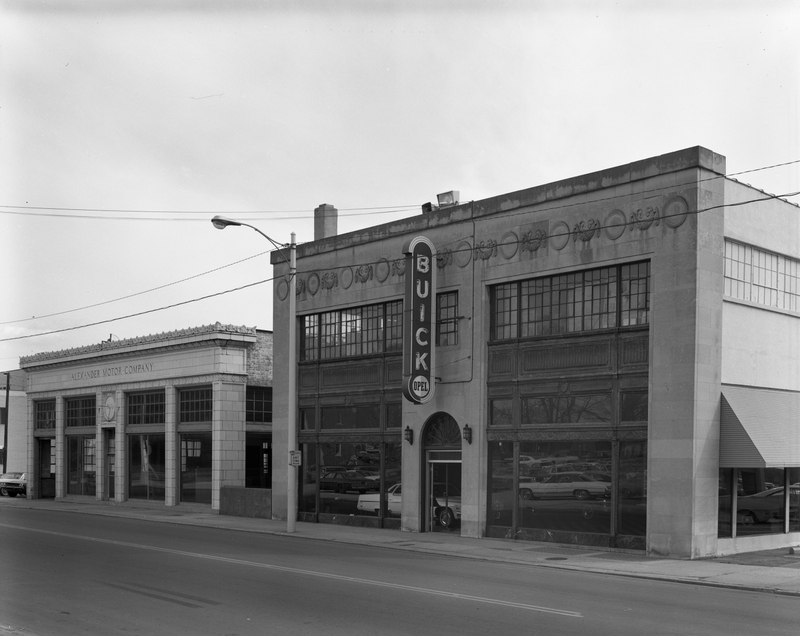 In 1924, they constructed their new dealership at 330 East Main St.
To get a sense of how things have changed in the world of car dealerships, the Alexander Ford Company hired Milburn and Heister (who designed Union Station, the Carolina Theater, and the Durham County Courthouse, among other buildings) to design their structure. Hard to imagine a present-day car dealership hiring a renowned architecture firm to design their dealership. 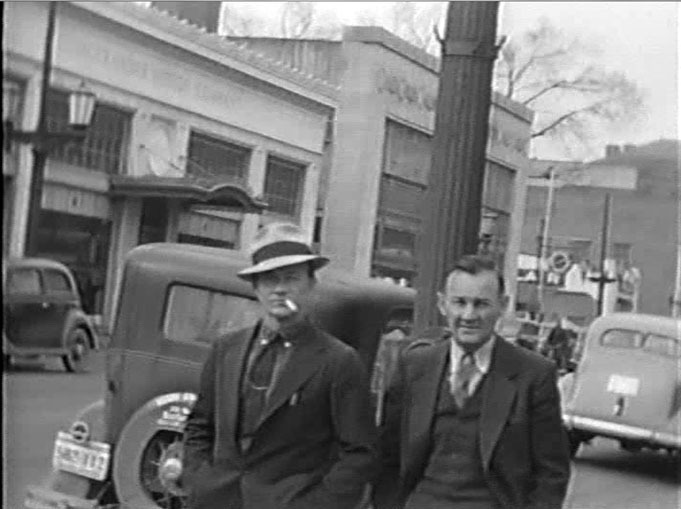 Alexander Motor Company (with the elaborate entrance awning) and Johnson Motor Company in the background, late 1930s. For decades, the dealerships on East Main Street were a staple in local advertising, trumpeting the superiority of their national brands as well as the quality of their maintenance and repair departments. The elaborate sign shown in the picture from the early 1960s must have been removed at some point prior to this January 1976 shot. Alexander Ford left this building in the late 1970s to move to an 11+ acre parcel across Carr Street from the American Tobacco campus that had been cleared by urban renewal. 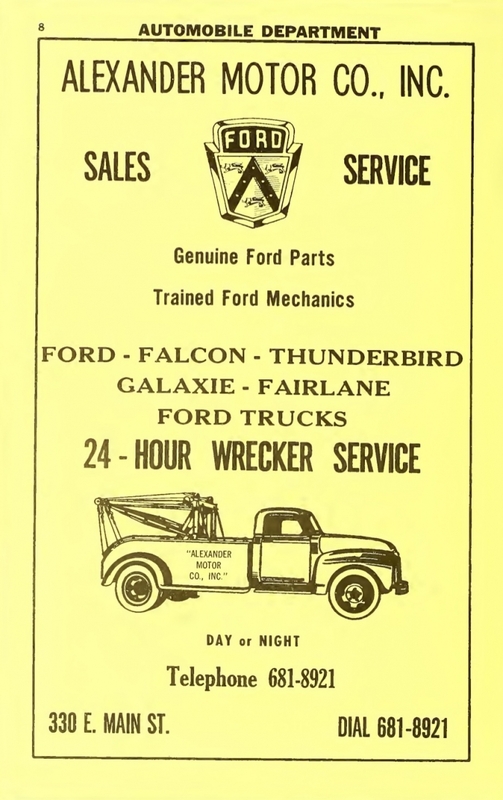 It was later renamed University Ford. The former Alexander Ford Motor Co., now the Durham Housing Authority, looking southeast, 2007. UPDATE, February 2019: At a January Stakeholder Advisory Group meeting held by the Durham Housing Authority as part of its DHA Downtown & Neighborhood Planning (DDNP) process, a design rendering for the "Preferred Concept" for redeveloping this block of East Main to Queen and Ramseur Streets suggested the former Alexander Ford Motor Company building would be torn down. Not only would this mean demolishing a unique, nearly century-old building that should be protected as a contributing structure to the Downtown Durham Local Historic District, this choice seems to go against community input solicited at earlier phases of the planning process - and alluded to in the same report - that favored preserving the building. Note that the adjacent former Johnson Motor Company building at 326-328 East Main (now occupied by Durham County Criminal Justice) would be preserved in this proposal, with Alexander Ford being replaced by a wing of the 5-story wrap-around structure to its left. Obviously the campaign to renew and expand investment in affordable housing - especially in the rapidly developing downtown district - deserves attention and support. 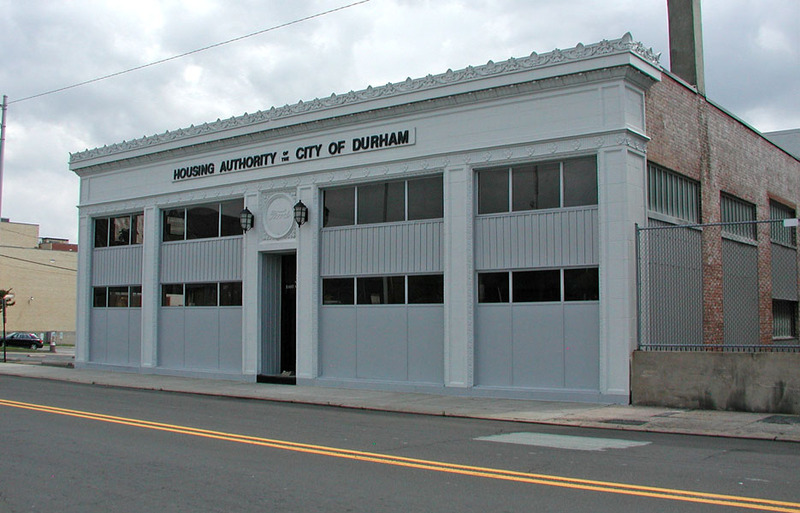 DHA needs to hear voices that care about this important objective as well as preserving the historic fabric that makes Durham the great city it is. In this case, for example, the proposed site is surrounded by some of our less lovable urban attributes - namely, surface parking lots where other buildings were previously razed. If this is indeed the best block for Housing Authority construction and the desired format is mixed-use with frontage to the curb as the drawing above indicates, couldn't this irreplacable building be restored as part of a livelier Main Street corridor surrounding the planned residential community? Hopefully there's an outcome that speaks to both questions of equity and preservation. For more on the DDNP process check out the DHA website, and consider attending one of their upcoming Community Concept Plan meetings. This building was the subject of a What's It Wednesday?! post on Open Durham's social media accounts (Facebook and Instagram), the week of February 20, 2019. Follow us and stay tuned for more finds!